Within a week of the release of the mixtape “Bobby Tarantino II,” rapper Logic topped the No. 1 spot on the Billboard 200 chart yet again. The mixtape dropped on March 9th. This makes it Logic’s second album to hit No. 1 on Billboard after his last album, “Everybody,” did last year. Bobby Tarantino is a “turnt-up, fun, alter ego” of Logic. Although he doesn’t consider it an alter ego, he says it’s more of a “vibe” than an actual character. He said Bobby allows him to rap and not care about what he says, but still keeps an open mind about what comes out of his mouth. “I like to refer to Bobby Tarantino music as ‘conscious trap music’,” he said. The first track on the album is actually a conversation between cartoon characters Rick and Morty, deciding what music they should listen to on their space ride. They eventually consider Logic, but have trouble deciding between “mixtape Logic” or “album Logic.” Rick explains how his styles are different and how important it is to choose the right music for a specific occasion. It’s really funny, and all true, and Logic even wrote the script himself. On this mixtape, Logic collaborated with Wiz Khalifa, 2 Chainz, Big Sean, and Marshmello. The first “Bobby Tarantino” mixtape came out in the summer of 2016, and fans have been waiting for the sequel ever since. And we got more than we expected. The sequel is better than the first one. They’re both amazing, but this mixtape is more “fire” in my opinion. He said it only took a week to produce “Bobby Tarantino II.” Although he gives every project his all, he said making Bobby mixtapes doesn’t require too much effort. He simply wanted to make music that people can “turn up” to, and lyrics that make people’s jaw drop. The song adresses suicide, and on the day of its release, the National Suicide Prevention Hotline received its second highest daily call volume in its history at that time. There are more eye-opening statistics at the website, thanks to Logic’s voice for survivors and those who are contemplating. Logic started his career with mixtapes, and then made albums. He has two alter egos: one called Young Sinatra and the other is Bobby. 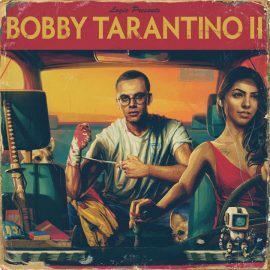 For more information about “Bobby Tarantino II,” you can look up a Youtube interview with Hard Knock Tv’s Nick Huff Barili, as Logic breaks down the mixtape and explains everything that went into this fun project. Logic is blessing all Oklahoma fans by performing in Oklahoma City at the Zoo Amphitheater August 1st. Artists NF and Kyle will join for his “Bobby Tarantino vs. Everybody” summer tour. Tickets are on sale now.